Simple Plan will perform at the 25th Anniversary of Warped Tour concert in Cleveland, OH June 8th, 2019! exclusive exhibit in honour of the milestone. More information and tickets can be found here! • The band will also be joining the Warped Tour 25th Anniversary shows in Atlantic City on June 29th and 30th, and in Mountain View, CA on July 20th and 21st. Tickets can be purchased here. They will also be performing at Beale Street Music Festival in Memphis, TN between May 3rd and 5th of this year! 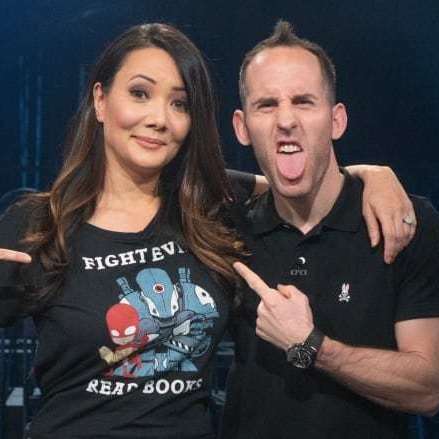 • Simple Plan drummer Chuck Comeau was a finalist in CBC's Canada Reads competition defending the book, 'Homes," by Abu Bakr Al-Rabeeah and Winnie Yeung. Chuck was defending his book against Ziya Tong, who won by a 3-2 vote with her book choice, "By Chance Alone," by Max Eisen. You can watch the final debate here! • Congratulations goes to Simple Plan who was recently awarded a gold YouTube play button plaque for surpassing one million subscribers on the platform! If you're not already subscribed to their channel, you can do that here! Nice Horse featured in Airbnb Spotlight! • Airbnb released a video profile of Nice Horse for International Women's Day. The band spoke about their experience as women in the music industry, and how Airbnb allows them to feel safe and at home wherever they choose to stay while on the road. Watch the full video here! • Nice Horse also stopped by CTV Calgary on March 14th to perform their song 'Tonight' - one of the very first songs they wrote together as a band. You can watch the full performance here! • Incura recently released their new single 'Remodel' on March 15th, 2019. You can listen to it here! • USS' song, 'Yin Yang', will be the official song for the 2019 NHL Stanley Cup playoffs! Tune into Sportsnet throughout the playoff season to hear it, and watch a preview of the advertisement here! • Scott Helman recently released Chapter 2 of his series, 'Scott On Tour. The series documents his travels across Europe last year while on tour with Vance Joy as support. You can watch the video above or by clicking here! • Myles Castello was recently featured in Halifax's The Chronicle Herald where he talked about his music career, his new song set to be released in Spring 2019, and more. The Australian dates for The Tea Party’s Black River Tour have been announced! Tickets can be found here! • Simple Plan will be performing at the Beale Street Music Festival in Memphis, Tennessee on May 4th! Tickets and further information can be found here! The band will also be performing at the Slam Dunk Festival in the UK on May 25th and 26th! Tickets and info are available here. • Our Lady Peace will be touring with Bush and LIVE! from June through to September on the ALT-imate Tour! The band will also be performing at the Tail Creek Mud & Music Festival on June 30th in Alix, AB. Johnson Crook will be performing at the 30th Anniversary of Dauphin's Country Fest in Manitoba from June 27th to 30th! Information and tickets can be found here! Myles Castello at selected shows so get your tickets here! • The Tea Party is halfway through the North American leg of the Black River Tour. Be sure to get your tickets by clicking here! The Proud Sons will be continuing their tour support on The Tea Party's Black River Tour this month. To view event details and how to purchase tickets, click here! • Myles Castello is finishing up The Hang Ups tour with Scott Helman this month! You can find tickets here. Johnson Crook recently completed their month-long residency at The Dakota Tavern, playing a combination of fan favourites and new songs they're currently working on! • Justin Nozuka has completed his Run To Waters Tour with special guest Craig Cardiff! We hope you loved the show, and be sure to share your photos with us! Also, be sure to listen to Justin's album, 'Run To Waters' here! Myles Castello has finished his tour with Ezra Jordan. Myles' song, 'Bad Company', can be streamed on Spotify's 'Pop All Day' playlist! Click here to listen! The rising R&B singer from Scarborough, Toronto’s sprawling easterly area, who feels as comfortable in the studio as he does performing on the stage, is garnering attention with his moody yet danceable cadence of club-friendly music. His song “Bad Company” dropped last autumn. The track, produced by The Uccis, showcases the young R&B singer and producer demonstrating vocal prowess, next to modern, dance floor sensibilities. An infectious self-assuredness permeates the track with a glint towards his city and its bright light. with listening payoff presented on a refrain built over a knocking drum beat. making his mark in 2019..
with all the information surrounding Myles! Our artists here at Coalition Music have some very notable accomplishments. Here are some from the month of April over the years! USS released their music video for Damini on April 3rd, 2012 and their music video for Yin Yang on April 10th of 2014. Simple Plan won the JUNO Fan Choice Award on April 2nd, 2006. The band also released their music video for 'Summer Paradise' featuring Sean Paul on April 2nd of 2012. Scott Helman released music videos for 'That Sweater' on April 22nd, 2015 and 'The Lion' on April 29th of 2014. Our Lady Peace released their album 'Curve' on April 3rd, 2012. The band also won JUNO Rock Album of the Year for Gravity on April 6th, 2003. Justin Nozuka released his album 'You I Wind Land and Sea' on April 13th, 2010. Our staff picked their favourite workout songs for this month's playlist! April is a great time to break out of the winter blues and start getting active! Looking for an internship in the music business? Coalition would love to hear from you! For more information on available positions, follow the links below! Office Admin Intern: Click here! Social Media Marketing Intern: Click here! Email your answer to info@coalitionmusic.com to win a Coalition grab bag! et les radiodiffuseurs privés du Canada.